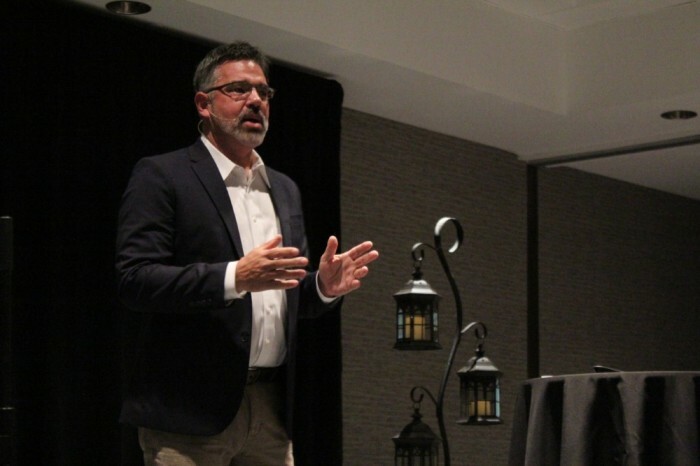 “Right now, very few — I would say in my experience — less than 5 percent of churches are thinking about the future, that is, the coming disruption of economics,” DeYmaz told a packed ballroom of Christian journalists, writers and publishers. He pointed out that a friend of his is the pastor of a church in Baltimore, Maryland, that lost $100,000 overnight when the Baltimore-based corporation Under Armour laid off 400 people. Because of this, the pastor’s salary and the church budget decreased and a number of church programs were cut. “It's not that those 400 people won't be able to get other jobs, it's just how fast that happens,” DeYmaz said. DeYmaz explained that “disruptive” churches should stand on three legs: spiritual, financial and social justice. However, many churches today are only standing on the spiritual leg, he contended. As DeYmaz is a proponent of multiethnic worship, he stressed that churches need to work to end segregation in the church and solve justice issues impacting their own local community. Additionally, he said, churches need to be innovative when it comes to revenue generation. As for Mosaic Church, it established a nonprofit entity called Vine and Village in 2008. He stressed that it's a “smart move economically” and allows churches to show people that the church is interested in what is going on in the communities in which they sit. “In our case, Vine and Village focuses and leverages all of our assets like a laser beam on the people of 72204 [a Zip code for an area of Little Rock with 30 percent poverty],” he added. One offshoot of Vine and Village is The Orchard, which is the largest food distribution program in the city of Little Rock that serves 20,000 people each year in a Zip code of 32,000 people. Vine and Village also runs other programs such as a chess club for at-risk children. Another nonprofit program established by Mosaic Church is called Immerse Arkansas, one of the first programs in the country to work with kids who age out of the foster care system. In order for a church to be “disruptive” in the economic sense, it should be doing things like repurposing property, creating jobs, generating tax revenue for the community and putting the talents of church members to use in the appropriate ways to further the mission of the church. According to DeYmaz, churches need to make the most out of the property they have. As an example, he mentioned how Mosaic Church (now located in a former K-Mart store) is generating income by leasing out about half of the building to a fitness club since 2013. The fitness club pays about $8,000 per month for 50,000 square feet. The reason behind the leasing of part of the building was to help offset the $7,400 per month the church pays on its mortgage. Because of the lease with the fitness center, DeYmaz said, 20 jobs and about $26,000 in tax revenue was created for the local community. Another way to generate income is for churches to monetize existing services. Most churches give out free coffee on Sundays for churchgoers. For Mosaic Church, the coffee costs roughly $3,000 per year, DeYmaz said. Although some churches put out a donation jar, they are never made completely whole on the coffee they serve. To solve this problem, Mosaic started selling sausage biscuits wrapped in aluminum foil purchased at a wholesale store in its cafe area. The entrepreneurial endeavor has not only offset the cost of the coffee but generated extra income that the church has put toward youth summer camp scholarships. Considering most churches are smaller than the average K-Mart store, DeYmaz told CP that smaller churches can do things like rent out unused offices or classrooms to an organization in their area looking for a cheaper rent option. In his interview with CP, DeYmaz explained that churches can also generate income by renting out their buildings for events like weddings or to another church in the area to worship on Sunday nights. Some churches might allow other churches to use their worship space free of charge because they believe it to be part of “ministry.” But DeYmaz believes it would be wise for those churches to start charging. Bigger churches, he added, might have print shops that can be used to generate money. Churches and other nonprofit organizations are legally allowed to start for-profit companies so long as the for-profit entities pays their share in taxes and as long as the profit from the companies go back to support the church or nonprofit that launched them. Although starting a for-profit entity can be daunting for clergy, DeYmaz stressed that pastors don’t need to fully understand how to operate a business so long as they can place that responsibility on lay persons in their congregations with experience running a business. Some churches also pay for janitorial services. Instead, DeYmaz said, churches could create their own cleaning service business by paying employees to not only clean the church building but also take on contracts to clean other buildings in the community. “Send your janitors out in the community. They get contracts on other places and net $30,000 a year and clean your church for free,” he told CP. While some people facing tough financial times might just “rely on God” or “have faith” that things might turn around, DeYmaz asserted that God calls on churches and Christians to be good stewards of what they are given.